Be prepared and leave nothing to chance. Use the wine tasting party checklist. Choose a specific varietal (i.e. Cabernet, Chardonnay, etc.). Have 6 (six) bottles by different producers. Try to get representative samples that include not only domestic but foreign wines of the same or near-same vintage (1-2 years spread). Keep a record of what you’ve bought, the vintage, where purchased, cost and comments/ratings from sources like Wine Spectator, Wine Enthusiast, etc. This forms a summary of wines tasted and should be printed for distribution after the tasting. 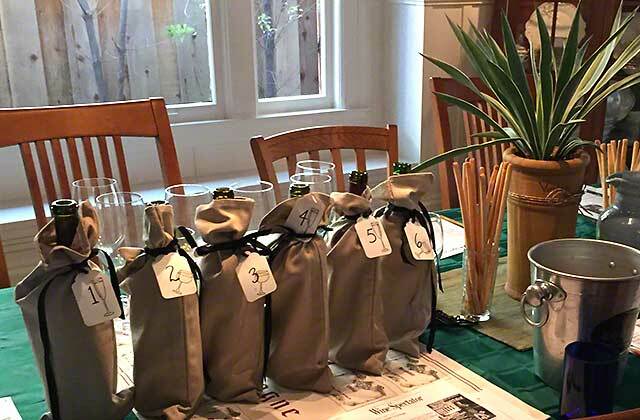 Make sure you have wine bags or something to mask the identities of the wines tasted. If screw caps, be sure to discard the collars. These wine bags should be numbered 1-6. Place the uncorked wines at least 30 minutes before tasting on your presentation table (especially white wines that have been refrigerated). Provide plastic spit cups (they may not be used by everyone but still supply). Provide water glasses and fresh, chilled water for palate cleansing. You may wish to include Pellegrino or some neutral sparkling water. Each taster should bring 6 glasses but, as the host, be prepared to furnish glasses for those who forget. Neutral snacks (i.e. unflavored breadsticks or crackers) should be provided to absorb and cleanse palates between tastings. The host/hostess should provide a regular meal (including wine) for the guests after tasting has been concluded. You may wish to match the cuisine with the wines tasted. It might be informative to have group members give their initial impressions of the wines in general before polling for individual rankings. Designate one person to record each participant’s tasting results on a master score sheet. Ask each taster to dictate 1st through 6th choices. Using a iPad or tablet format a spreadsheet that can calculate the scores. At the conclusion of the scoring, unmask the bottles and pass out the summary sheet reflecting brand, cost, etc. Serve lunch or dinner, and open up some new bottles of wine – not necessarily the same varietal tasted. Collect the money for the cost of the tasting/meal. Decide on who hosts next tasting and what wines.